Notes on door-to-door visits made by members of Jehovah's Witnesses breach EU data privacy law, according to the advocate general of the EU's top court. His finding backs the view of Finland's data protection commission. The Luxembourg-based Advocate General Paolo Mengozzi on Thursday rejected a lawsuit filed by the Jehovah's Witness movement that asserts its members' notes are gathered only individually and do not breach the EU's privacy directive. 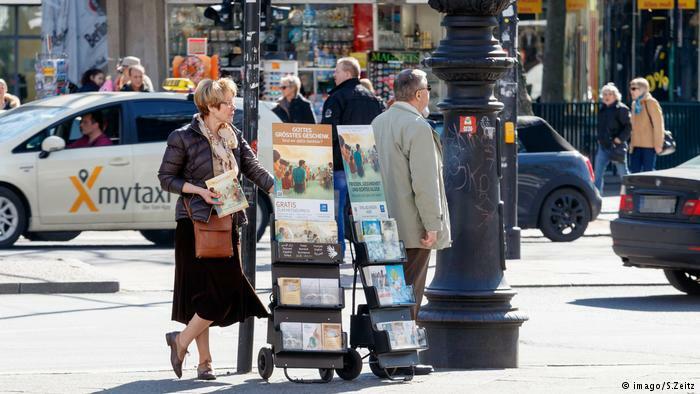 Instead, the report by the advocate general, whose findings often carry weight in the European Court of Justice, concluded that the Jehovah's Witnesses (JW) are centrally organized and the people visited by the group must give permission for note-taking. As evidence, Mengozzi said that prior to the legal dispute the movement had provided printed forms for note-taking to its members. JW brought the case after a Finnish data protection commission ruled that the religious group could only record and process information on people its members spoke to within the confines of EU and Finnish privacy laws. Finnish authorities found that JW members took notes on family members and the religious orientations of those visited without the individuals' permission for use in later visits. Based in the US state of New York, the movement formed in the 19th century and has more than 8 million members worldwide. It preaches door-to-door, seeking to convert "outsiders" to its literal view of the Bible and belief that the end of the world is near. Followers object to military service. During World War Two, members were widely persecuted. Advocate general reports typically provide the basis for rulings by the Luxembourg court. Its verdict on the Finnish case is likely in several months. The court has made a string of rulings on privacy issues, including its dismissal last week of a bid by an Austrian activist to bring a class action against Facebook. In a related 2015 ruling, the court forced the EU and the United States to replace their "Safe Harbor" data sharing arrangement with a new system supposed to better safeguard personal data that firms in the US hold about Europeans.